Ages 3 and up. 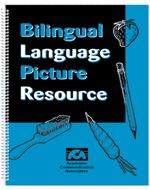 This easy-to-use book includes pictures of common vocabulary items in English, Spanish, Italian, Vietnamese, French, and Japanese. The pictures can be used with language-impaired clients or second language learners. Language scenes that can be used to develop descriptive language skills are also included. Suggested language activities are included. The picture pages may be reproduced.